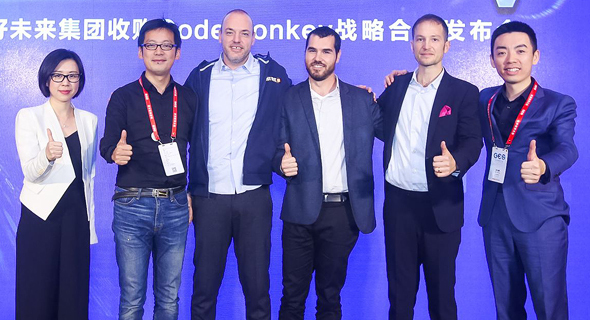 Nasdaq-listed, Beijing-headquartered educational service company TAL Education Group has bought Israeli game-based learning startup Codemonkey Studios Inc. for $20 million, the latter announced Tuesday. Tel Aviv-based Codemonkey develops game-like computer programming tutorials for children and markets its products in Israel, the U.S., and ten other countries in Asia, Europe, and South America. In Israel, its tutorials have been incorporated into the national education system, with 250,000 students learning to code through the Codemoneky platform each year. Founded in 2013, the company raised $2 million to date. Codemonkey employs a team of 15 people. TAL Education Group is an education tech company running learning centers in more than 40 cities in China which serve more than 2.3 million students. TAL also operates an online learning platform with more than 18 million users. The company is traded with a market capitalization of $16.7 billion. Yishai Pinchover, co-founder and CEO of Codemonkey, told Calcalist in an interview that Codemonkey will continue operating as an independent subsidiary of TAL and will be responsible for research and development of programming tutorials for the Chinese market as well as other markets. The deal, which was finalized last month, has been four years in the making, Pinchover added.